Today, we did a Samurai skirmish game, its been a while! Ian set up the scenario, and was rather mysterious about it - we soon found out why! 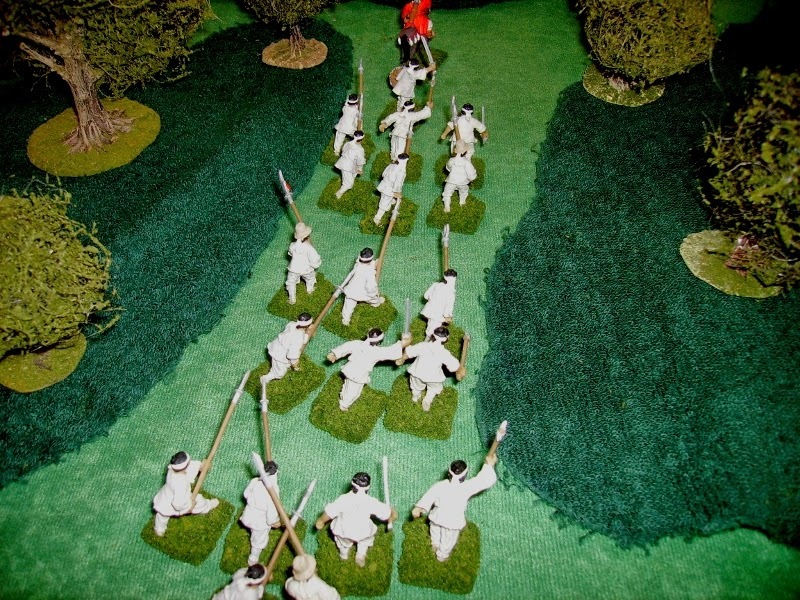 Initially, Lawrence, Phil and I were told to choose and deploy about 30 men in each of 3 retinues. We were told that we were a small force going to join a siege further up the road...when we heard shouts and conch shell blasts to our right! - an ambush! My force of armoured Samurai and Ashigaru set up behind some reeds. 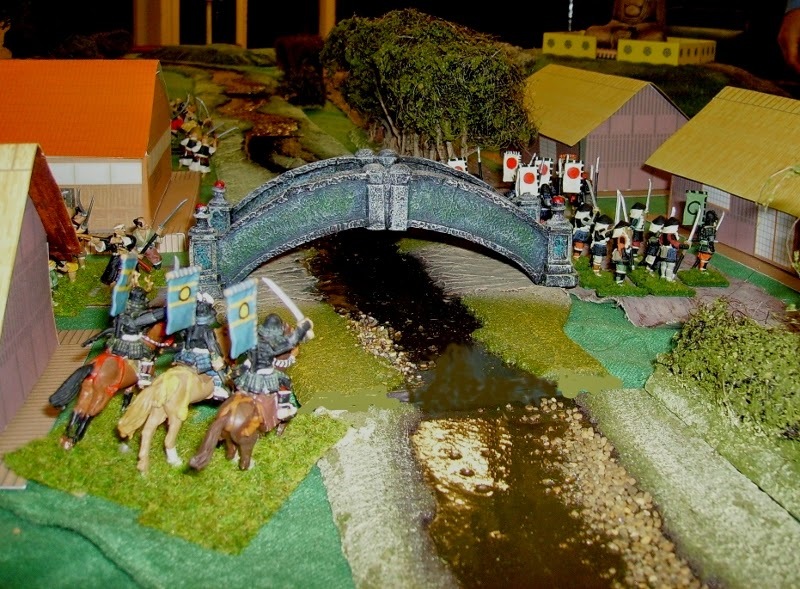 Lawrence set up his mounted armoured Samurai behind the well armoured village garrison. His unarmoured Ashigaru were safely deployed in reserve. Lawrence placed a small group of missile troops in front of the village, supported by his commander. Having placed our Samurai, Ian sprang his surprise...We would be running his newly painted Korean guerillas. We would therefore be fighting our own best deployment. Clever. I got a horde of screaming peasantry! Ian took a small group of Warrior monk archers on my right. The Korean commander occupied an enclosure on the largest hill in the area. ...and a small body of heavy cavalry. Phil got a sizeable group of (former!) 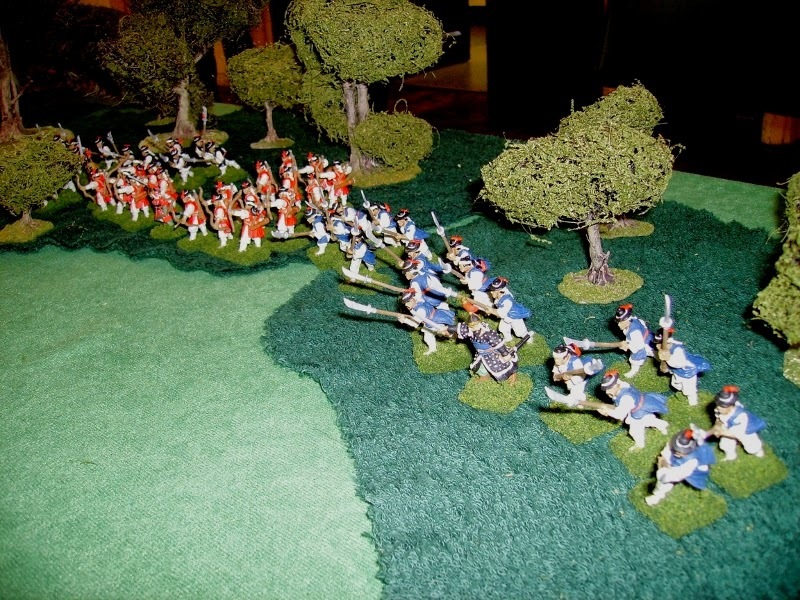 Garrison troops! They included a large group of the excellent Korean archers. After a brief discussion, Phil's semi-regulars began to outflank the unsuspecting Japanese left. Having deployed the Japanese, he knew the weakest point in their position to attack! 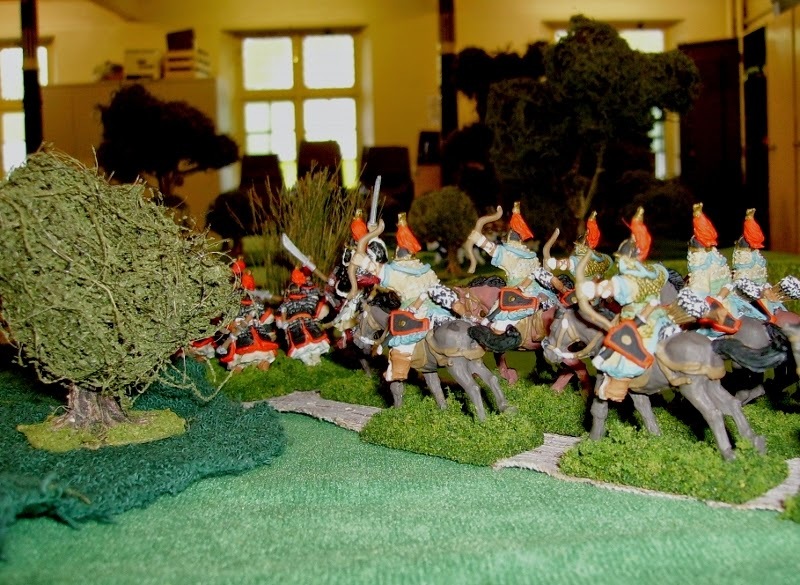 Lawrence left his infantry on the road, and sent his horse behind the village. 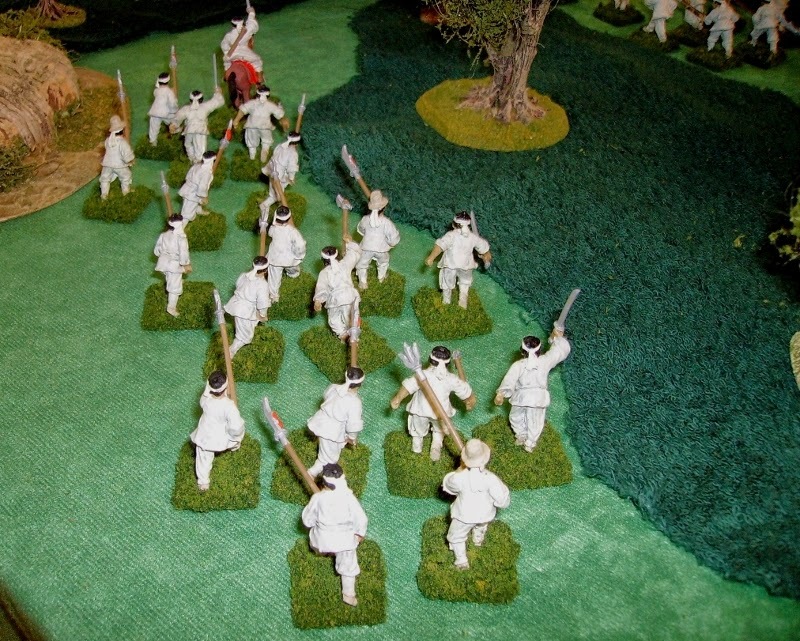 Ian sent his archers to demonstrate against the front of the village. My horde filtered trough the woods, the plan being to engage the enemy after the flank attack had gone in. As the Garrison troops approached the Samurai left, a group of archers heard them coming trough the woods and attacked. One can imagine their surprise to have met a full third of the Korean army! 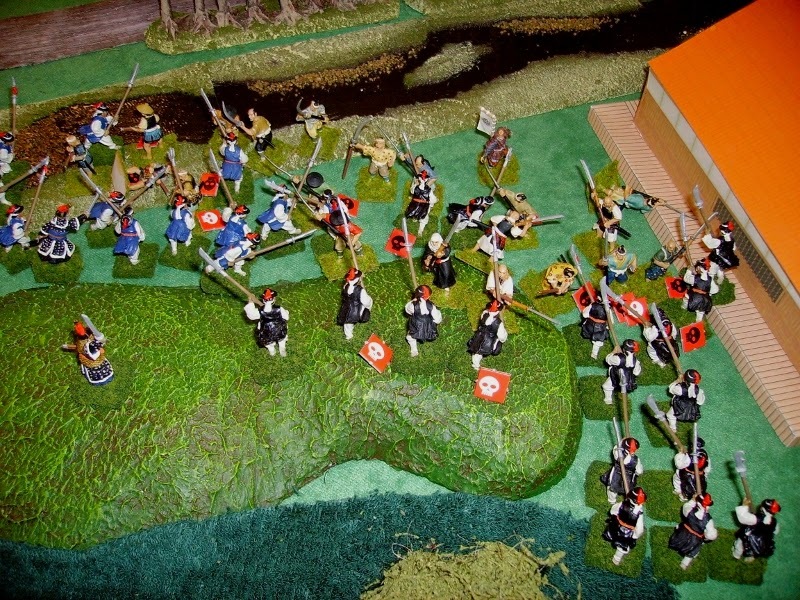 The Japanese were quickly surrounded, but continued to fight bravely! Suddenly, the village garrison Samurai came under a storm of arrows. ..and were also making things difficult for the Japanese advance guard. My Guerrillas had reached the edge of the woods overlooking the Japanese positions, but stayed hidden. Meanwhile, the brave Japanese archers finally succumbed to numbers. The Korean cavalry now arrived and began harassing the unarmoured Japanese troops at the village rear. The Japanese began to take losses. 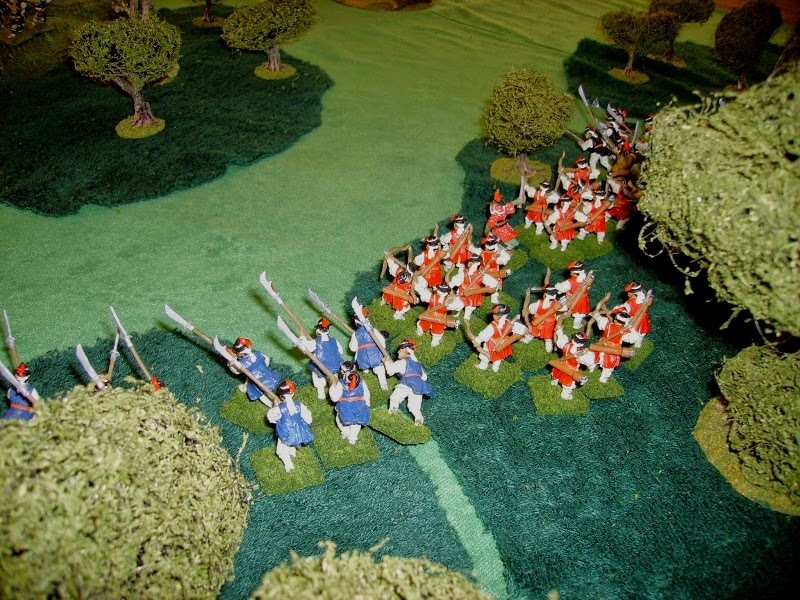 The Korean archers, having decided the woods were not archer friendly, now moved to shoot the Japanese in the rear. Unable to reply, the Samurai had to stand and 'take it'. The Japanese advance guard, overwhelmed by numbers, now fled back into the village. Having disposed of the archers, the massed Korean Garrison troops now attacked the Japanese left from the rear. The Samurai counter-attacked and the Koreans found they had a fight on their hands! Now, my Guerrillas began their attack. In the village, the Ashigaru died to a man, rather than give ground. On the left, the Koreans lost one of their commanders. Numbers once again began to tell, as the Japanese ranks thinned. The brave Samurai fought bravely to the end. 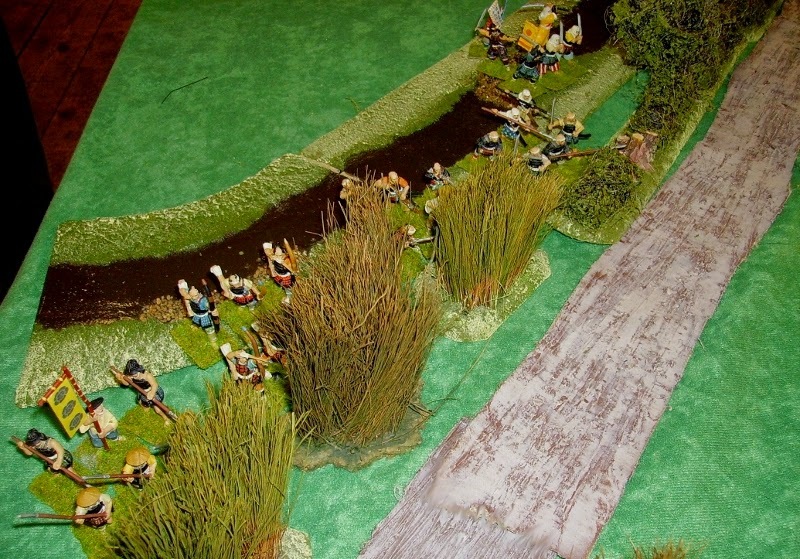 At this point, the Samurai position became untenable,and the survivors retreated back up the road. The scenario was clever in making us play both sides to our full abilities, but I have updated my rules to make them more suitable for this sort of scenario. I think next time too, we may have to balance the forces a little better too, as, at least to me,sadly, it seemed rather less than challenging! Today, we did another Wild West game set in New Mexico in the 1880s. The scenario was that a group of six gunmen and a few brave souls from the town are being attacked by an Apache War-party. I had my Pistolero, Nathaniel Clinton and my side-kick, Ronan with a rifle, at the church. Two locals in the tallest building in town. Rod had his character, Bill, with a former Prussian officer, Von Kluger. More locals held the stores in the main street. Lawrence had his man Ted, with a side-kick, in the building at the end of the street. A group of six Apache riders appeared from the south west. Some dismounted Apaches approached from the South. One group probed into town, bypassing the house held by Ted. One of the locals held his fire as they approached. Chico and Pedro, at the food store, did likewise. The Apaches moved on cautiously. A lucky shot hit one of the Apaches in the chest and he went down. Alerted, another group of Indians began going round the other side of Ted's house. In the centre of town, Bill sent Von Kluger up some steps for a better view. The Apache horse advanced towards town. After climbing a rise, they came in sight of the town. Von Kluger spotted them and fired! Back at the South of town, the Apaches took cover, looking for their enemies. Seeing the fire-fight down the street, Nathaniel and Ronan left the church and probed down the East side of town. Ted, rather bravely, decided to stay in his building as it was outflanked by the Apaches. 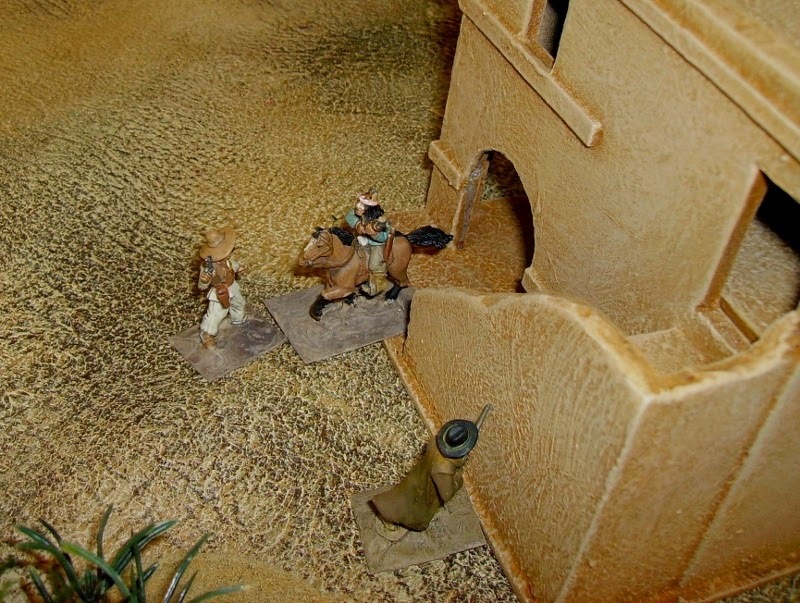 The Apache horse galloped into town to escape Von Kluger's fire. On the ground floor of Ted's house, the other Apaches were shooting back at the locals too. The cavalry raced into town and attacked the distracted locals from the rear! Neither Ted, or the Indians below, dared shoot into the confused melee. Chico was chased through his store by a horseman. Another pursued Enrico past Bill. ...and quickly killed with a lance thrust. Back in South, Ted emerged from his upper floor room and shot at the Apache horsemen...ineffectively. Two of the Indians dismounted, to despoil the dead local! The Apache who had attacked Enrico turned on Bill, and killed him with a Tomahawk. Ted, meantime, shot an Apache coming up the stairs. The Apache rushed him as Joseph ducked back into the house. Amazingly, Joseph won the ensuing melee! Ted, meanwhile, was fighting against more Apaches. My men, Nate and Ronan entered Chico's store from the rear. Some more Apaches advanced into the main street in support of their horsemen. Most of the cavalry had dismounted and were skirmishing. ...with Rod's new character, one of the locals in the tall building. Nate and Ronan began shooting at the cavalrymen across the street. Rod and his new sidekick also shot at them. ..but the range was too great for them to help much. Unseen by all, one of the horsemen was moving round the town towards the church. What was he up to? Joseph, meanwhile, was moving through the town, reaching Rod's dead character, Bill. Where was Von Kluger? Ted, meantime, descended the stairs as the Apaches took cover in the bottom floor room. From here, he turned and 'Fanned' his pistol into the room! The survivors fled out of the rear entrance. Back at the church, the errant horseman was up to no good! The cavalrymen across the street from me decided to attack by outflanking Chico's store where Nate and Ronan were hiding. Joseph fired at the third cavalryman who had been wounded by my fire. Nate and Ronan dealt with the other two. Gonna need another new church though!